Every day, I walk the dog down our local park and the ground is covered with lovely pine cones. Sometimes I can’t help myself I pick a couple up and bring them home with the intention of creating something with them. They just sit in a bucket in the fireplace. However, the other day I was looking at the pine cones and it struck me that they look like mini Christmas tree. That’s when I got the idea to make my mini pine cone Christmas tree with lights ornaments. One of my favourite things to recycle is tin cans. 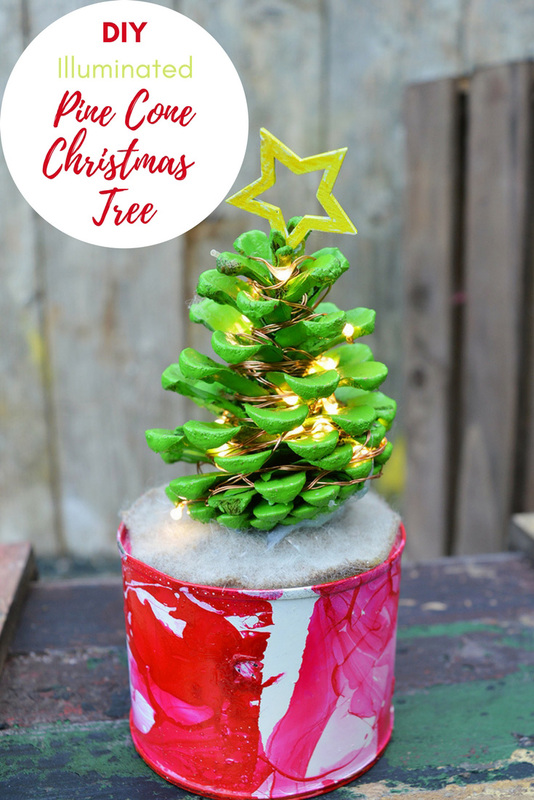 So I decided to use a tin can as my Christmas tree pot but also add colour to it by painting the can with a marbled effect. Also what Christmas tree is complete without lights. 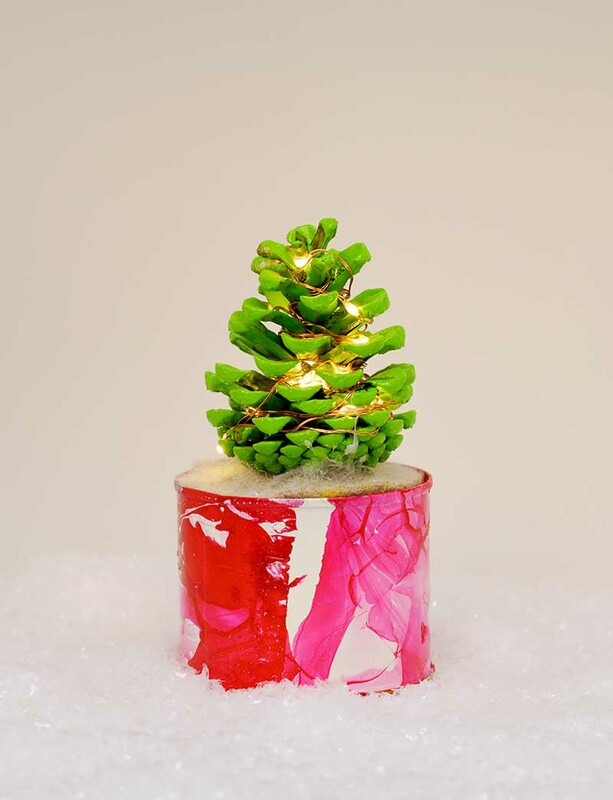 I think these colourful mini pine cone Christmas tree looks really cute and make a lovely desktop Christmas decoration. My kids want me to make them one each for their rooms, which I will do as I have a plentiful supply of pine cones. 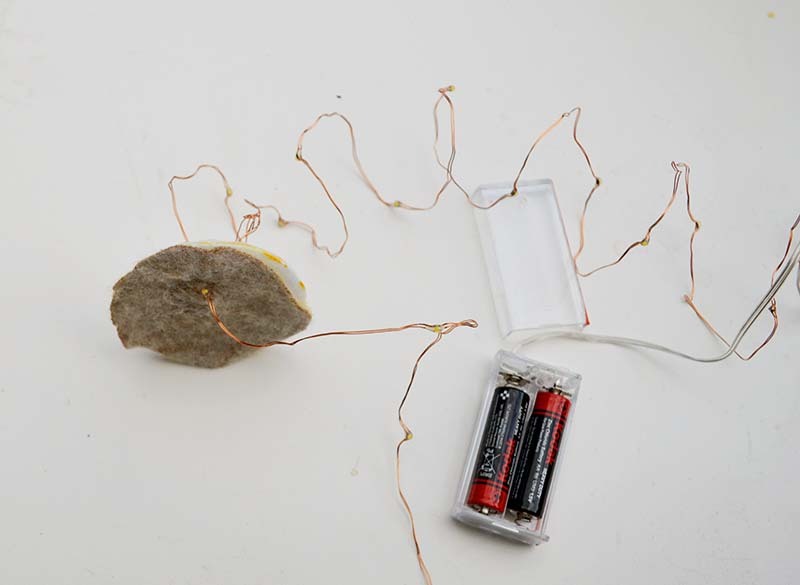 Battery operated copper string lights – You want the ones with a small 2 battery pack or micro battery operated. 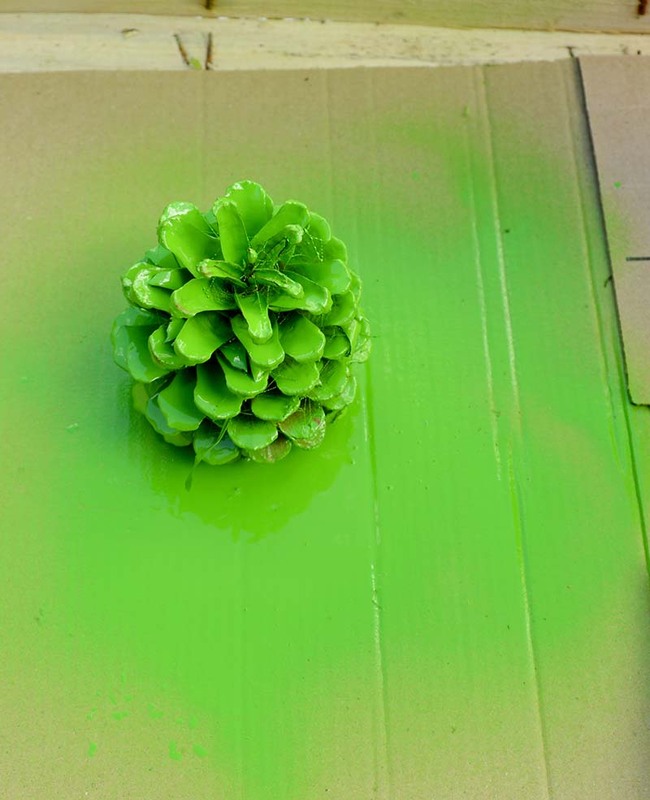 Firstly wash and carefully dry the pine cone and then spray paint it green all over. 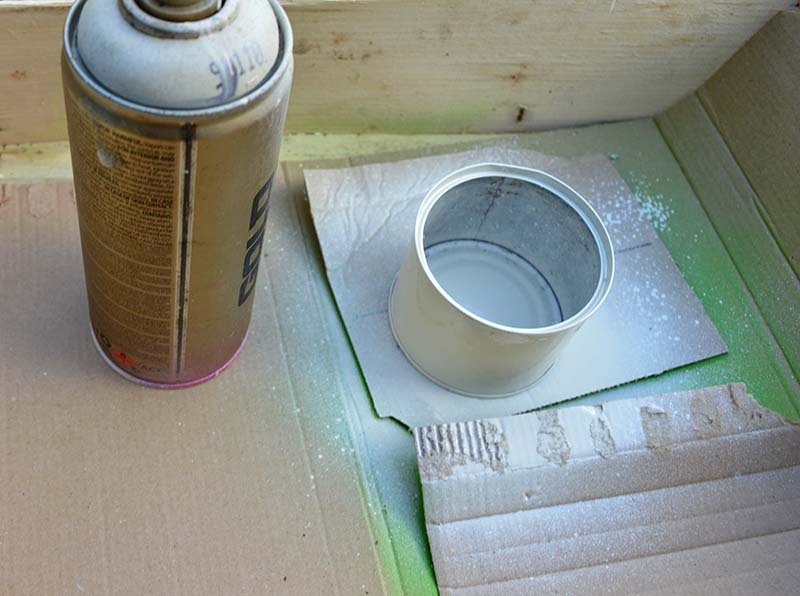 Next spray paint the tin can cream. 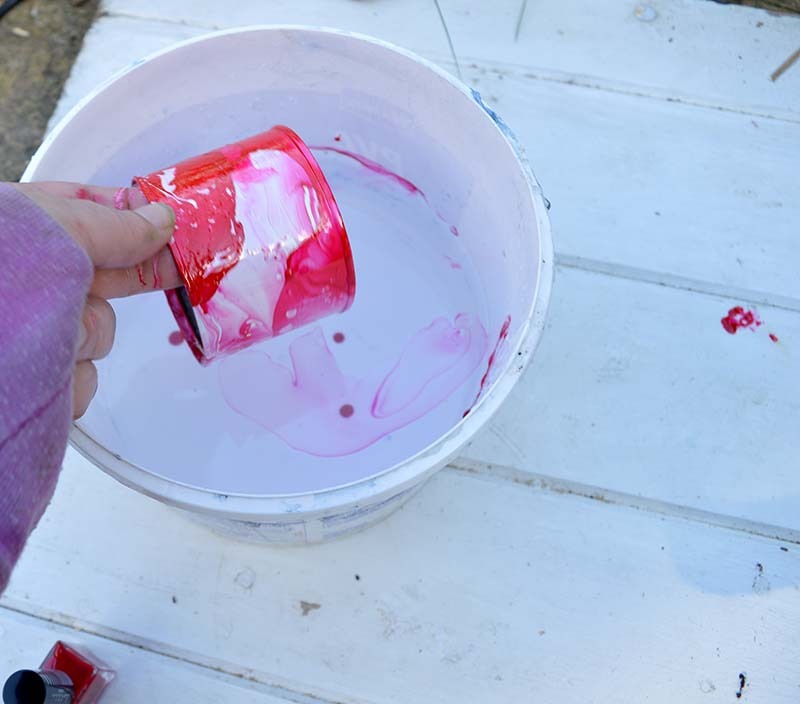 When the paint has dried on the tin can it is then ready for marbling. To do this in a tub of warm water add a few drops of nail varnish so that it forms a film on the surface of the water. 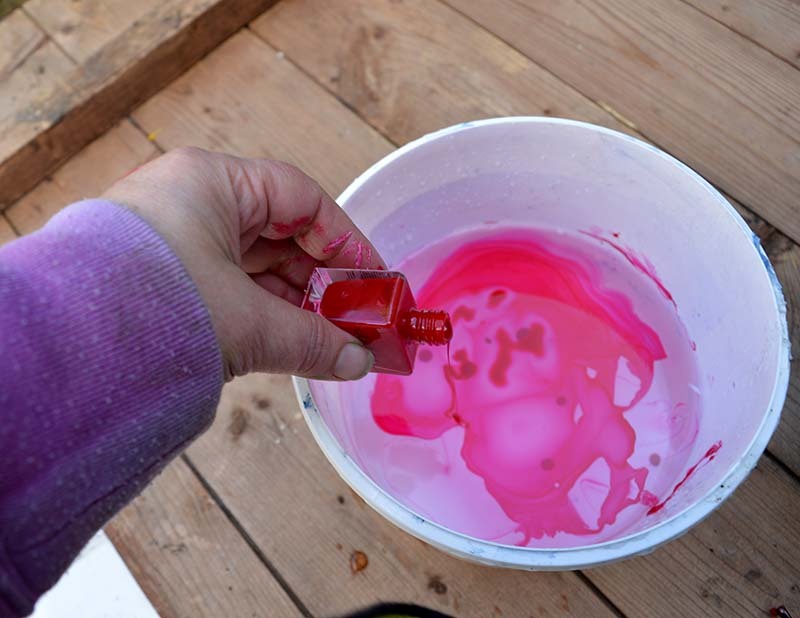 If the varnish doesn’t spread out you can use a cocktail stick to help it spread across the surface of the water. Then carefully dip the outside edge of the tin can into the water. 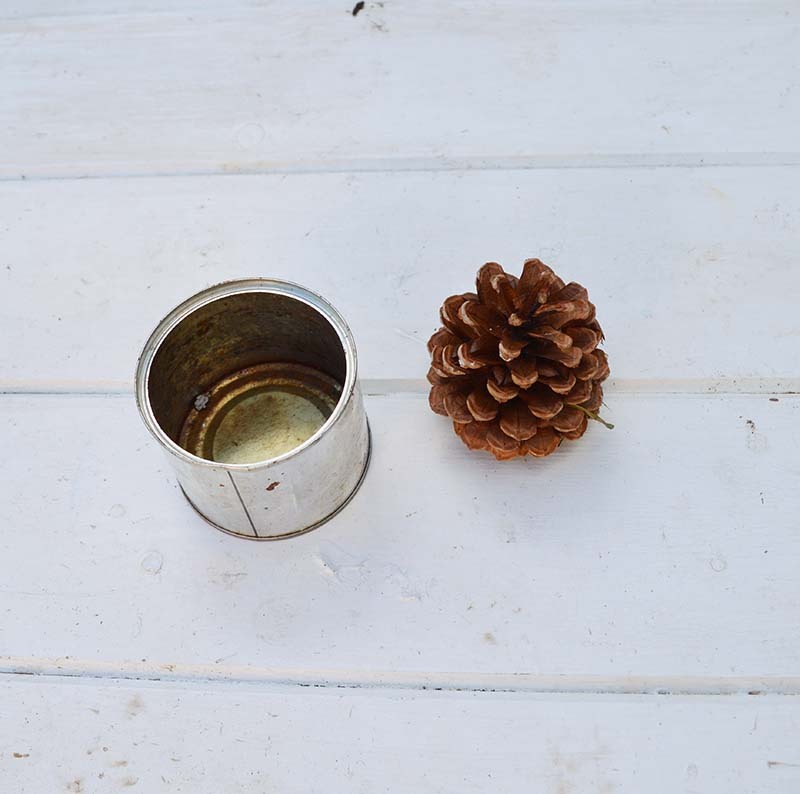 The varnish will cling to the tin can and as you roll the can cover it completely. Assembling the pine cone Christmas tree. 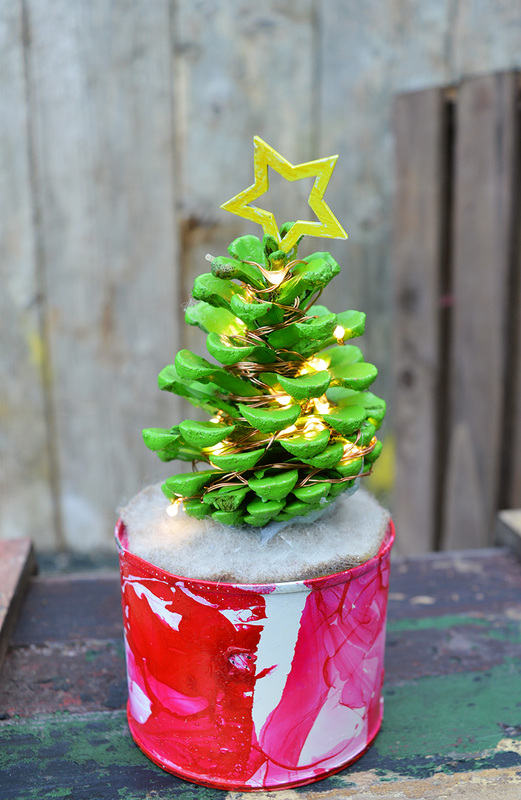 Draw around the tin can onto the cardboard and felt and cut out a disc of each material to fit the top of the tin can. Glue the discs together and pierce a small hole through the disc to one side. Thread the copper string lights through this hole. Using a hot glue gun, glue the pine cone to the center of the felt disc. 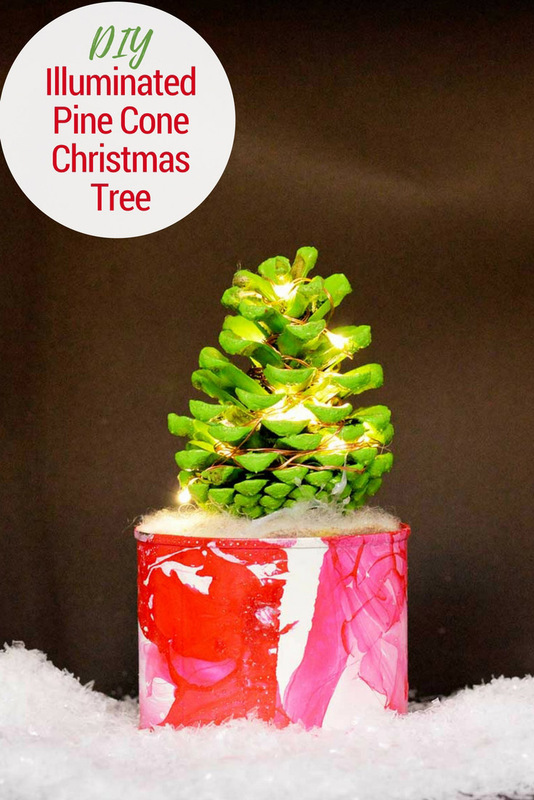 Then wrap the string lights around the pine cone Christmas tree. 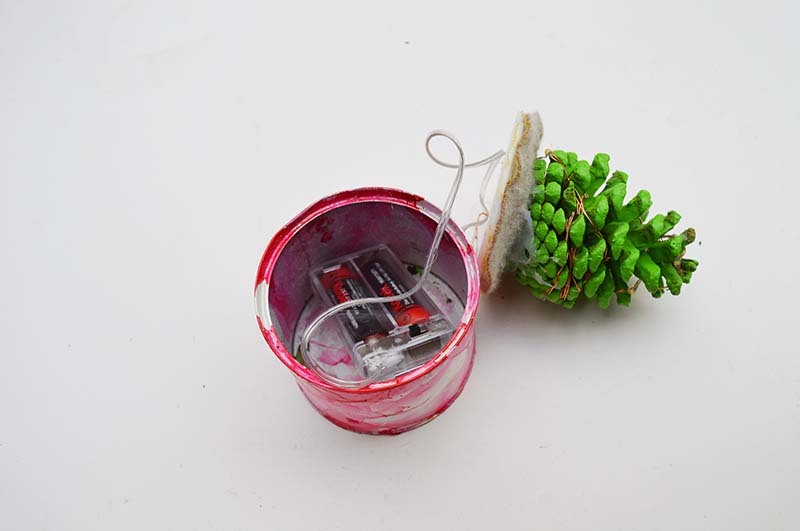 Place the battery pack inside the marble tin can and then place the tree on top as a lid. 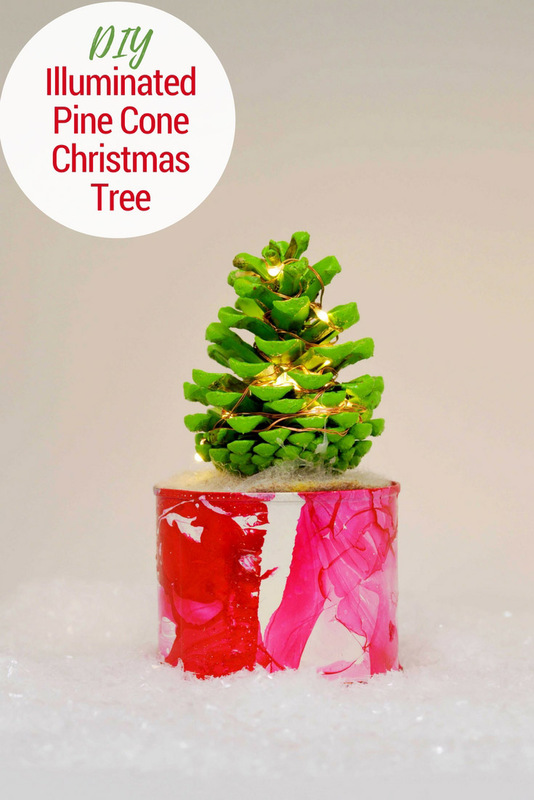 You might want to check out some of my other popular DIY Christmas decoration posts. Or if your looking for more pine cone Christmas crafts there are a lot here on allfreeChristmas crafts. Interesting idea! I’d decorate the pot in a more Christmas related style. What a cute idea! We’ve used pine cones to make ornaments before but never to make the actual tree. Thanks for sharing this fun craft idea with us at the Virtual Refrigerator. Pinned. Pine cones are great for so many crafts. Hi. Two Chicks and a Mom featured your cute Christmas Tree at Party in Your PJs this week–hope you can stop by again! Thank you so much I look forward to seeing it. Happy Thanksgiving! This is such a clever idea. I love the marbling on the can too – I tried that a while back and it’s such fun isn’t it? I’m sure someone in our family has a tree with those tall thin pinecones on it, I’ll have to check, they could work really well for this idea. Thanks, Julie. Lucky for me there is a park at the end of my road full of trees with pinecones in different shapes and sizes. Claire this is really original. Why had I never thought that the pinecones looked like little trees? You did a great job and I imagine they must look awesome all lit up. The kids could decorate them with those bags of tiny pompoms you get in the pound shops and perhaps some glitter on the tips. Thank you Anne Marie. Not only do they look like mini Christmas trees but they come in all different shapes and sizes. I’ve just spotted some really cute dinky cones in the park that I want to make something with. You always make simple things look so beautiful! Love it. Pinned. Thanks for sharing with our link party! This is really cute. 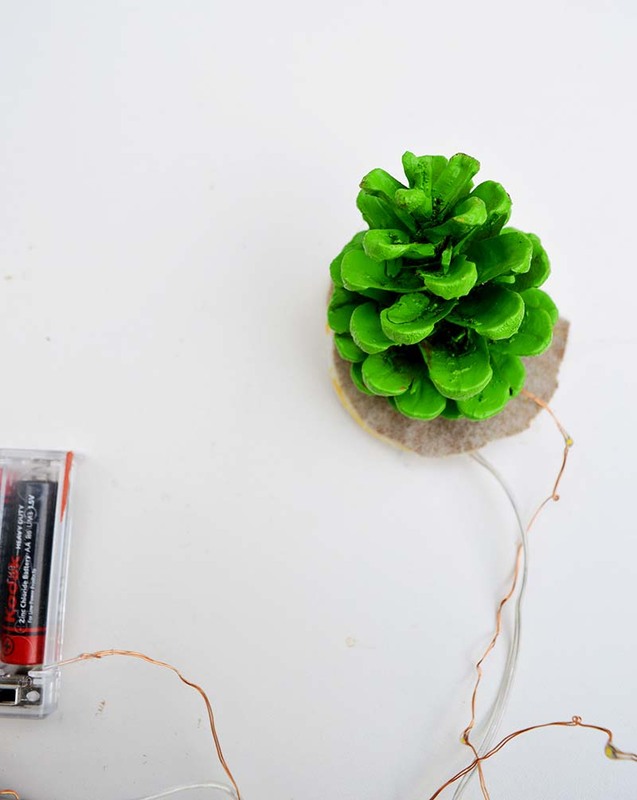 I am fixated on all sorts of uses for those mini lights, love your idea. What an adorable idea. This can be tucked in so many places around the house. Thank you, yes this one is actually in the kitchen at the moment. What a cute and creative idea! And you make it look so simple, too! Thank you, it is simple Kelly. This is so creative Claire! 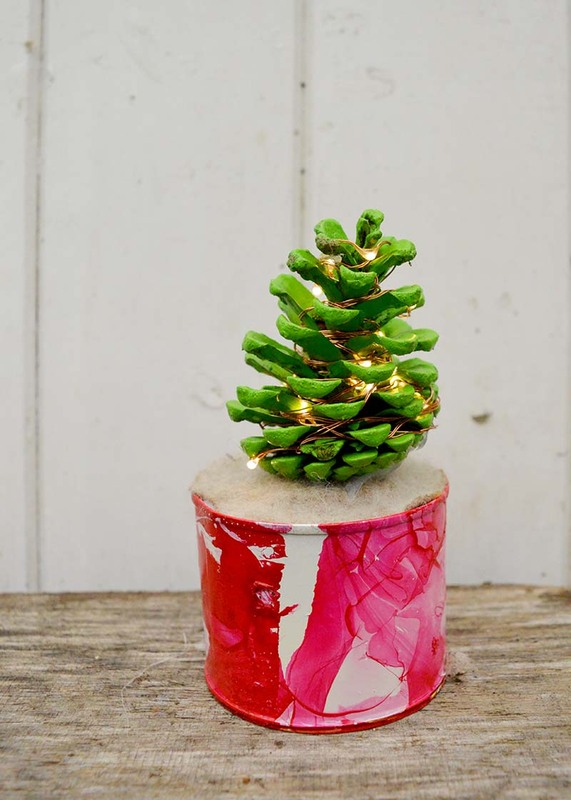 I love the dipping effect on the tin and adding tiny LED lights to the pinecone is perfect. Thank you so much Toni. I’m really into the marbling effect now. Claire you are so clever. This is adorable! How do you think of these things? Thank you, Wendy. My head is just stuff full of craft which is dying to come out. I don’t have the time unfortunately to make all the things I want to make. Very cute idea! Would look super as place settings or on a mantel. Visiting from Remodelaholic. Thank you, Victoria. I think I will be putting a few of these on the mantle. So clever! …and cute too! 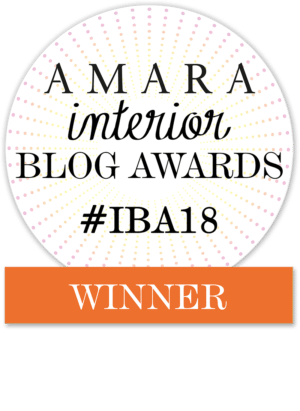 Thank you Jennifer and thanks for organising the blog hop. I like these cute pinecone trees and that you added lights. Thank you, I like my Christmas lights. Thank you, I’m lucky there are loads of pine cones in the park at the end of my road. Thank you so much. They are really easy to make. Super cute project Claire! I can see a few of these in a row as a centrepiece for a table without it being too bulky!! Great idea! Thanks Sam, I like the centrepiece idea. Claire, you always have such fun and cheerful ideas. Thanks for the bit of whimsy. Thank you, Lynn. I believe crafting should be fun, colourful and make you smile. I’m living and traveling full-time in my RV and this would be the perfect Christmas tree for us! Thank you, yes this is definitely a portable Christmas tree. Living and traveling in the RV sounds interesting. Super cute project! I love how you colored the can. Thanks for sharing! This is so cute! I love the marbling effect. These would make great stocking stuffers too! Thank you, I’m into marling at the moment.